Demonetisation primarily was a well-planned move-with Aadhar and PMJDY- in order to curb the black money market. There was estimated cash of Rs 15.84 trillion in the economy before demonetization and the government expected some 85% of this to turn into banks. But almost 99% of the cash was deposited in the banks during the period, failing the objective of reducing black money i.e. untaxed money from the market. The policy was a complete failure on this front. Come to think of it, will huge money launderers try to save their money from taxation and be careless enough to have it moving around in the economy? Hardly so, those versatile tax-evaders would have had their funds parked in safe securities in India or out of reach, outside of the economy. Even if they had it around, they very comfortably converted it all into legal tender through the route of money-mulers. Who were the targeted in the end? Those middle-class people who thought it was unfair to give a large share of their hard-earned incomes to the government who would not fulfill their promises and chose to make themselves a bit happier with more share of their own income. Undoubtedly, they are supposed to pay taxes as per the rules without assuming the role of judiciaries. But what quantum was PM Modi targeting with this move? Should a police focus on petty stealers or the frauds of millions of rupees? However, Modi government did not entirely fall on its face and came up with the idea of ‘Digitalisation’ as the hidden, primary objective. This was a well-thought move. In developed countries like the USA, less than 60% of transactions were carried out through cash whereas, in India, this was greater than 97%. Rolling out this comparison as a reason for digitalization when a bold step of de-legalizing the high valued currency had back-fired, was a perfect savior to the government and it grabbed it well in time. And hence, the move was promoted as a step towards ‘A cashless economy’. Demonetization, while hitting hard on the middle-class section of the society and pushing India’s economy backward for a while with crashing stock markets, did achieve a few benefits. It proved to be a major threat to terrorist funding. Because higher denomination currencies ceased to be legal tender, illegal arms and ammunition market faced a downturn with no sufficient cash to fund the activities planned. Also, it attacked fake currency, as those will not be accepted by banks and will destroy them when brought to them. In addition to this, Havala transactions were reduced by this move. 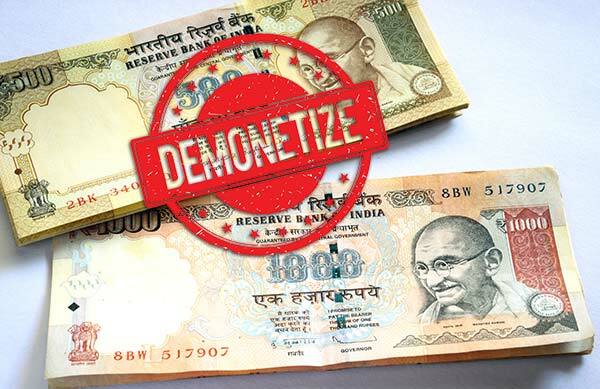 Demonetization brought about a big blow to Havala traders on 8th of November, 2016 as they would have already collected cash from their clients to be paid off to out-station parties the next day and these could not be in the same high valued currencies they had received. They were in a big fix that day. In a way, it sent out to the participants of the market that the more they go online, the better for them. There was a large, ignored party during all this fuss, however. They were housewives. In India, housewives have a habit of saving money from the money they receive for household expenses. This practice goes on for decades till their children grow up for an expensive education or marriage and they disclose this saving to the family. Because this saving is undisclosed to even the family and is mostly in the high valued currencies that were de-legalized, they had a hard time explaining to the family(in some cases) and then standing in queues to turn this cash into bank balance to be able to use them in future. But, in a way, their savings are now earning interests which would not have been the case otherwise. All in all, India seems to be recovering from the phase and again out to achieve the growth rate of 7.5%. With elections due next year, PM Modi is trying hard to get India back on its knees and achieve great results to be elected again. How to Gain High Grades in the College?